With Christmas well and truly on the horizon (our Christmas tree is up now - did you see the pictures?) it's definitely time to start thinking about presents. I'm on a really tight budget this year so I'm determined to only buy thoughtful, wanted gifts and to shop around for the best prices for them. I'm not going to buy anything 'just for the sake of it' either, which is something I'm usually guilty of every year. The first tick on my Christmas shopping list is something for Evie. She loves playing with her big sister's dolls house, so I've got her one of her very own. I've been looking at wooden dolls houses for the last six months and had expected to pay around £100 for a three storey Georgian style one. 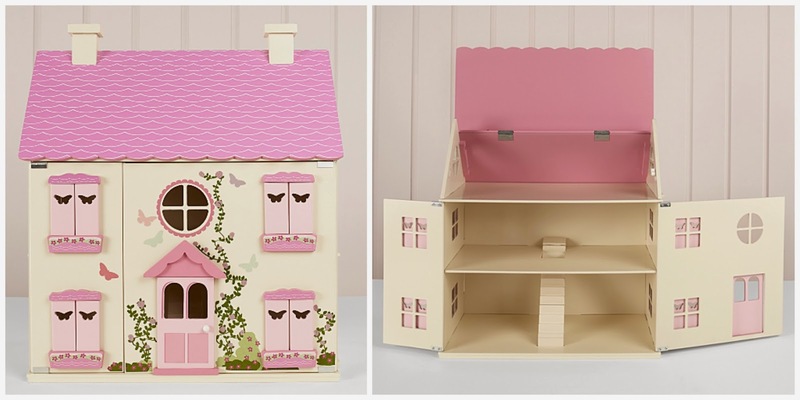 They're pretty readily available, and my favourites were the Early Learning Centre Rosebud Country House and the Great Little Trading Co Cherry Blossom House - that is, until I discovered ASDA's George Wooden Dolls House. Did you know ASDA sold wooden toys? I didn't. Admittedly I don't have an ASDA supermarket nearby so I'm not a regular shopper there but their full range is available online and it's really very impressive. I've not put the dolls house together yet (pics to follow after Christmas!) but have taken it out of the box and can confirm that the quality is fantastic. It's really heavy and solid and looks so darn pretty! In actual fact, it's such a beaut that I'm planning on keeping it downstairs and putting it in the window of our front room so that every one calling in or passing by can see it! It has five rooms over three floors, all connected by a central staircase, and they can be accessed by the hinged front, or the removable roof. It's painted cream and has a pretty pink tiled roof with shutters on the windows and pretty flowers growing up the walls. It really is a timeless, traditional toy and I can imagine it being handed down to other members of the family in years to come. The best bit of all? The price. When I saw it I was gobsmacked as, like I said already, I had fully expected to have to fork out around the £100 mark for something like this. It's £35. Thirty five English pounds. How amazing is that? 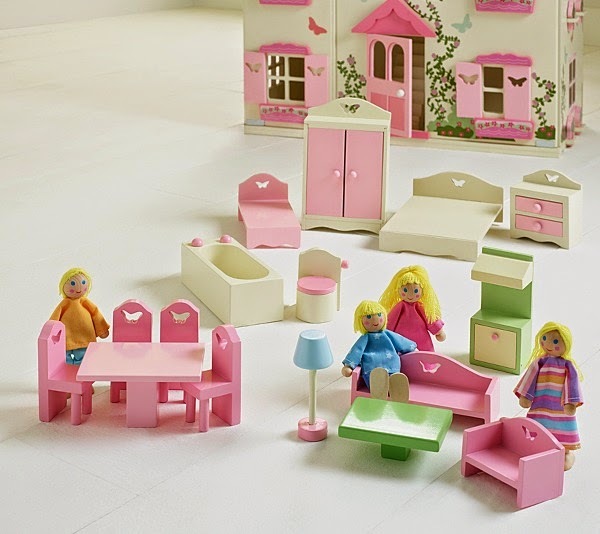 I've also got the ASDA dolls house furniture set to go with the house, which contains simple pieces for the kitchen, living room, bedroom and bathroom in pale pinks, whites, blues and greens. The cost of this (£15) is the same as single room sets from other leading toy shops, so a mega bargain. The other popular sets are of a similar size so will fit into this house though, so if you have them already or see something you particularly like they can be mixed together. DISCLAIMER: ASDA very kindly gifted us the George Wooden Dolls House and Furniture Set for the purpose of this post. All words and thoughts are entirely truthful and my own.